Thanks Calvin for the invite to guest on the LGBT Plus network blog. Delighted and honoured to do this – as an LGBT Plus member in an allies capacity! 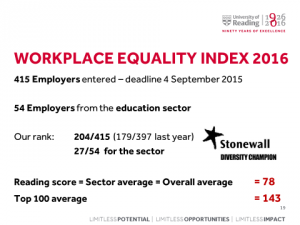 I thought I would use this opportunity, given that I am the Dean for D&I taking the lead on the LGBT+ front, and given that the University’s main LGBT target is to achieve Top 50 in the Stonewall Workplace Equality Index (WEI), by 2020, to say something about the University and the WEI. What is the WEI? Why does UoR participate? What is involved in taking part? How are we doing? What are we doing to improve? 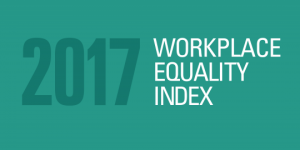 “The WEI is a powerful evidence-based benchmarking tool used by employers to assess their achievements and progress on lesbian, gay, bi and trans (LGBT) equality in the workplace. Why does UoR participate? The University announced a target in February to reach Top 50 in the WEI by 2020, having submitted for the first time in September 2014 to the 2015 WEI. Having coordinated the submission this year, it is clear to me that the process of submission encourages worthwhile self-reflection, and is a great spur to do more. And the structure of the WEI provides a useful framework to think methodically about a future action plan. Having said this, it is a lot of work each year to make a submission – of course time that could be spent elsewhere – and it is not immediately clear that one needs to submit every year. But we did submit again this year – and have decided now that we must submit every year. In large part, this is because LGBT Plus told us to do this! The story behind this is that I came on board as Dean earlier this year, and got last year’s WEI feedback from Stonewall in February. Questions in my mind were: Should we apply again in September 2016? Did we have time to make change in response to the feedback before then? Did we have the resource and time to do this and make the WEI submission, given that our D&I team had also – really as highest priority – to make a successful University Athena SWAN submission at the end of April? To help think this through Calvin as LGBT Plus chair surveyed the LGBT Plus membership. The clear steer was that the University should submit into the WEI every year, and the VC as our LGBT champion supported us in this. I am sure this was the right decision. What is involved in taking part? Making the submission is a lot of work – a lengthy questionnaire to complete, writing 1000’s of words, and attaching lots of evidence – we attached 91 pieces of evidence this year. We also need to do a staff survey which is still ongoing. Policy – on equality and diversity, on bullying and harassment, on transitioning at work – and this section asks also about our LGBT-related University targets – our targets are Top 50 in the WEI, and 95% to declare sexual orientation on ESS, by 2020 – and about our D&I team. Training – our general D&I training (online and at induction), and is this specific to LGBT+ identities? LGBT+ specific training for staff dealing with bullying and harassment complaints; training for line managers and those involved in recruitment (we do good stuff here, including unconscious bias work). 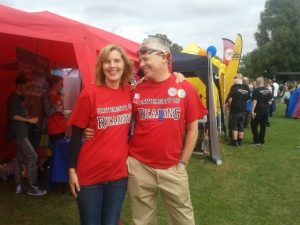 The Staff Network Group – our LGBT Plus network – do we have one? Does it provide staff with confidential support and advice? Do our appraisal and promotion processes recognise network contributions? Does the network do: awareness raising events, collaborations with other network groups (e.g. Women@Reading), do we work with other groups externally, have we done events/initiatives/seminars specific to: lesbians, bi, trans, intersections with BAME, religion, …? Is the network consulted by the University on stuff? Size and gender breakdown of network? All-Staff Engagement – what has the University (separate to LGBT Plus) done in the last year on communicating to all staff on LGBT front, e.g. promoting awareness training, the network, promoting events (IDAHoBiT, LGBT History Month, Pride, Trans Day of Remembrance, …)? What is in staff induction? Does staff counselling explicitly support LGBT+ issues? Have senior staff and board level staff been part of this engagement? Do we have an allies programme, and what has it done? Do we have visible role models – and for which of L-G-B-T? Career Development – do we monitor participation of LGBT staff in career development ops? Do we advertise, specifically to LGBT staff, leadership, professional development programmes, LGBT-specific leadership/development programmes, LGBT-specific seminars and conferences? Are we specifically working to increase LGBT diversity within senior management? Are there visible and out L-G-B-T senior management? Do we have openly trans staff? Line managers – do we scrutinise managers D&I knowledge/experience on recruitment internally and externally? Do we hold managers accountable for D&I achievements in their teams? How does UoR engage with managers on LGBT: specific resources? Encouragement to join in as allies? Asking them to support participation in networks from their teams? Monitoring – in the last year have we explained to staff through all staff communication why we monitor sexual orientation and gender identity, what we will do with the data, and how confidentiality will be maintained? Do we monitor fairness in recruitment & career progression, job satisfaction, exit rates by sexual orientation and/or gender identity? Do we report monitoring and associated actions to: CEO, regional managers, all staff, externally? 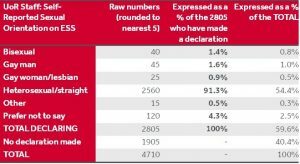 What proportion of our staff have declared their sexual orientation through a suitable HR system? Do we monitor those who identify as trans, and how do we ensure info kept confidential? Procurement – what do we specify to suppliers in contracts about D&I policies, D&I training? Do we work with suppliers in collaboration on best practice in LGBT D&I? Community Engagement – How are we projecting externally our commitment to LGBT equality through website and social media? In terms of community outreach, in the last year have we: had articles/adverts in pink press or mainstream media making clear our LGBT commitment? Sponsored staff participation in LGBT community events? Supported materially local LGBT groups? Supported anti-hate crime/bullying campaigns/training? Held recruitment targeted at LGBT? Have senior staff spoken at external LGBT conference/event? Have we worked in collaboration with other organisations on initiatives that have impacted LGBT people in wider community? Finally, marks are given based on the results of a staff survey run by Stonewall – this is running now for the 2017 WEI, closing 4 November. Looking ahead we know that the criteria will be revised for the 2018 WEI – they revise every three years – and we know there will be more on trans equality and on the organisation’s interactions as a service provider – for us this means how we work with our students. the 415 organisations who chose to enter – with a score in the rankings that is precisely the sector and overall average. To reach Top 50 by 2020 we have to roughly double our score from 78/200 to 150/200. This is a large change to make, but we have started already in the last six months, and we expect our score to increase in the 2017 WEI based on our submission on 2 September. What are we doing to improve? I am going to talk here about the period between February, when we got the feedback on our 2016 application, and 2 September when we submitted the 2017 application. An encouragingly large amount has happened to the extent that I’m entirely confident that – with hard work collectively – we can reach the University target of Top 50 by 2020. We have held a Workshop with LGBT Plus staff networkto think through an LGBT Allies programme and work on an LGBT action plan. LGBT Plus, UoR have held Joint events with RUSU to mark International Day Against Homophobia, Biphobia and Transphobia. We have hosted an in-house LGBT Allies training day led by Stonewall, attended by managers from across the University, including the VC. 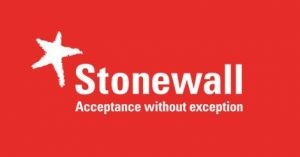 We have supported applications for 8 places on the Stonewall Role Modelsand Leadership Programmes. Consulting with LGBT Plus we have made revisions to the monitoring categories for sexual orientation on ESS to bring these in line with Stonewall and HESA recommendations, and have had a campaign that has increased sexual orientation self-declaration from 32.6% last year to 56.2% this year. For the first time we are starting to get some sense of the UoR LGB population. The University and LGBT Plus have started to work with a new local network of employers, and other organisations working to support LGBT communities, including Support U and Berkshire Healthcare NHS Trust, hosting the meetings at UoR – next is the pm of 11 Jan.
Senior manager Dale Cooper has been profiled on the staff portal as an LGBT father. We’ve revised the criteria for academic promotion this year and, as we have done this, have explicitly flagged LGBT Plus activity and leadership (and those for other networks) as examples of academic citizenship and leadership contributing to promotion criteria. 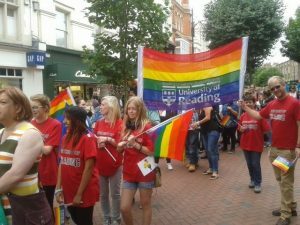 We have had an official UoR presence for the first time at Reading Pride. We have communicated to the Leadership Group – and supplied Stonewall resources – on supporting LGBT staff, including in our global operations. We have changed policy documents to make them more explicitly LGBT-friendly, consulting with LGBT Plus. We have, via LGBT Plus, advertised Aurora & Springboard opportunities directly to LGBT Plus + Stonewall training ops. Looking to the future, there is much more that we can do, much more that we can and need to achieve together, not least to reach the Top 50 target by 2020. 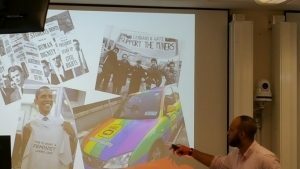 I am agreeing with the LGBT Plus Steering Committee an LGBT+ Action Plan Group to drive WEI forwards, we will launch a new allies programme in February for LGBT History Month, and the University has just awarded D&I strategic funding to help make all this happen. I look forward to working with LGBT Plus, and staff and students across the University, on making change happen – and having great fun and making many new friends as we do this!